Norm Scott alerts us to another description of this event over at Gotham Schools and the “pretty incendiary comments” that follow it. A. Some teachers in public schools are fighting hard for their space, supplies, lower class size and all the essentials of a good learning environment. B. Some charter school parents are not so much parents as messengers of the DoE/corpocrat/charterization line. C. The DoE is breaking laws and keeping the public uninformed and disinformed over the entire issue of placing charter schools into existing public school buildings. D. Foremost in the agenda of every grassroots ed organization is to make sure resources around spread around equally, schools and teachers are not maligned, and communities are not broken up into competing factions. On the new CAPE blog is a report on the meeting PS 15 parents attended last night to demand that the PAVE Academy find different space by June 2010 as promised. 1. Hold Pave Academy and the Department of Education to the agreement they made with our community, the promise they made to our students; two years temporary housing in PS 15- that means out by June 2010. 2. 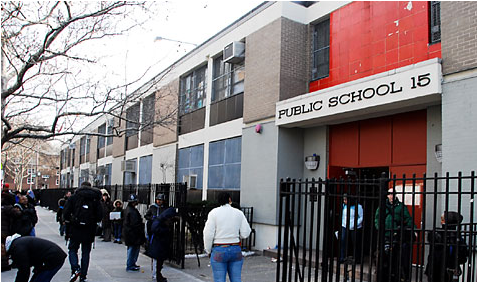 Work and seek to reevaluate the formula for shared space so that Community Public Schools, like PS 15, are not negatively impacted by the shared space policy. It may be too late to curb the impact at our school, but if we can prevent this from happening to other school communities, it is our moral imperative to do so. We need intrusive, unequal chartering to actually stop.